the error popped when I disenchanted something with the garrison cauldron. I do not have enchanting as a profession. (*temporary) = "attempt to call global 'GetTradeSkillLine' (a nil value)"
skillMatch = "Your skill in (.+) has increased to (%d+)." ... But here it is. Are you going to be updating this for Legion? I've never spoken French, that's why it's so wrong. a) Whenever I go to the Order of the Awakened vendors in Lion's Watch, Dropcount says "new Vendor Found" .... forever, until I close the vendor window. I can check again, it might be any vendor in Lion's Watch. ETA: It's only the Arakkoa vendor on the right, whose name I wrote down and now can't find. *headdesk* I can't have a browser and wow running at the same time, or this would be easier. The other Arakkoa (the one that stands tall and can fly) gives me no problem. b) On a toon I hadn't logged into for a while, I bounced in and out of Dalaran (L72 toon that I'd been mucking about with old content in Outland, now bringing it up to level), and now I have the book icons for the Higher Learning books on my minimap. While I had checked 'books' to put on minimap, the problem is that they're showing when I'm in Toshley Station... Nethergarde... Stormwind.... Turning in old quests to clear out my quest log. (I'm odd that way, I'd rather turn them in than abandon them.) I haven't logged out completely, but I did reload twice (for other reasons) and it's still there. I took pictures of my minimap in Nethergarde if you'd like to see..... I expected it to be, but it is NOT on the same coord numbers as in Dalaran.... the one that really forced me to notice it is that one is on top of the quest receiver, Quartermaster Lungertz, at 60.13, 13.52, and there is no book on that coord point in Dalaran. ETA: On another toon, I was in Stormwind and the dots were showing up at the edge of the minimap. That character hadn't been to Dalaran since I installed the addon. Note: the little blots that show where rare creatures sit are showing up just fine, and appropriate ones for my zone. Last edited by Barleduq : 03-06-16 at 01:17 PM. Sorry I didn't see your posts before. I will have to examine this a bit later as I am in no position to do that right now. But you do seem to have an issue with quests you have already done. This is a list provided by the server you are on, and should be quite fixed. I will have a look shortly. Bug for the second time? I'm sorry, I haven't spoken french in some 40 years (yes, I'm an old F). I logged into two characters (after the one I mentioned in the previous comment) with no problems. The third character (making this 4 total so far) had this pop up upon login. I'm redacting the list of addons this time. There's a second error below this one, that came up when I did the JC daily on this toon - when I clicked the NPC, upon completion. I'd guess this is a 'filling out the db' issue, except it didn't do it on the other toons that did the alchemy daily, or the dwarven bunker daily. qName = "Jewelcrafting Special Order:  Wedding Bands"
(*temporary) = "attempt to index field 'Quests' (a nil value)"
Last edited by Barleduq : 02-11-16 at 08:11 AM. I am aware it's been a long time with no updates now, but I can assure you that there is a major update being debugged and deflawed. This major update aims to meet some long sought after possibilities. For one, it will aim at those who wants to limit DropCount to what they specifically want to use it for. In effect, zero memory usage for the data you don't care about. Secondly, it aims for you who want as much data as possible. There are big changes in this, incorporating some nifty memory saving techniques (*), enabling previously unheard of amounts of data. As an example - would you want to know where Wool Cloth drops? I mean, at what coords in a specific zone? And, maybe, you want that plotted on your world map like the native quest tracker for grinding purposes. You get the idea. If it drops, DropCount is tracking it. (*) Last checked, 100MB Lua data was crammed into about 12MB memory. In the chat message given by DropCount, the word "thought" should be "though" . "A summary will be presented when the process is done. This will take a few minutes, depending on the speed of your computer. You can play WoW while this is running is the background, even thought you may experience some lag or lower FPS." Thanks. Added it to the code just now. 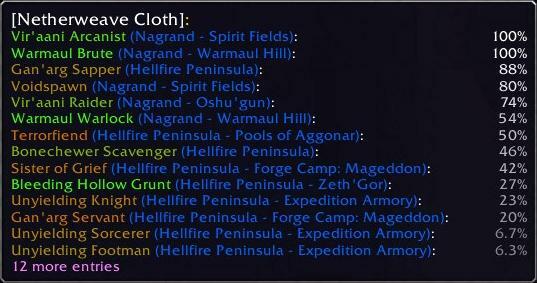 The new file (v1.40rp) is only for a repacking of the addon and does not have this change. This because some reported error with the zip. Any way to start whit an empty DB? The r4 release should fix it for you. i downgraded to the pre-r3 release, and the problem went away, so it seems that it is something with this release, but it could be something stupid i did wrong. going to be an update for 4.3? Just wanted to know though. Is there a way to remove the minimap button? Not at the moment, no. Good idea, though. I'll see what I can do.